Run-DMC was honored Sunday, 30th August 2009, when a street in Hollis Queens was renamed for them. 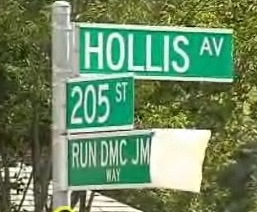 Hollis Avenue and 205th Street will now be known as Run-DMC/JMJ Way. Run-DMC is the first rap group to have a city street renamed in their honor, in the neighborhood where they were born and raised.